A strong third period from the Owen Sound Attack was too much for the Erie Otters to handle. 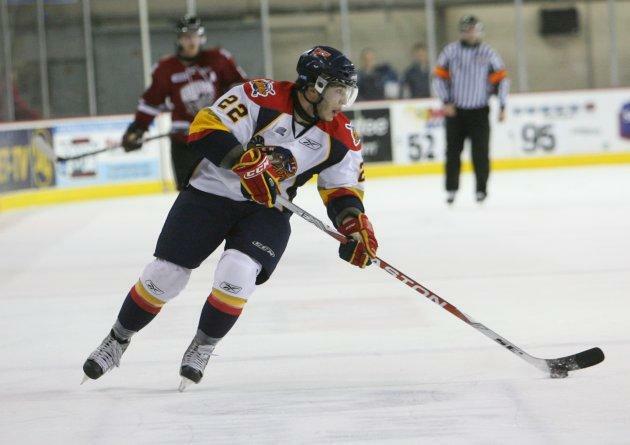 OWEN SOUND, Ont., -- The Erie Otters might be thankful that they only have one game left this season against Owen Sound at the J.D. McArthur Arena. The Attack scored four times in the third, including Liam Heelis' game-winning goal with 3 minutes, 19 seconds remaining, as the Otters lost for the 14th straight time in Owen Sound by a 6-3 decision in front of 2,983 fans. After a scoreless first period in which the goaltenders – Ramis Sadikov and Owen Sound's Jordan Binnington – took center stage, stopping a combined 18 shots, Phil Varone got Erie on the board 32 seconds into the second period with his 21st goal of the season. In what would become the trend for the game, Owen Sound was able to respond and make it 1-1, as Jesse Blacker beat Sadikov at the 10:04 mark. The game featured three ties and 66 combined shots on goal. Owen Sound would quickly add another goal to take a 2-1 lead just over seven minutes later as Roman Berdnikov took advantage of a Mike Cazzola turnover in the neutral zone which led to his Ontario Hockey League goal. Erie recovered from the blow and generated a rush that saw Brett Thompson sneak past the Owen Sound defense. Before the winger could unleash a shot, he was pulled down by Matt Petgrave, which resulted in referee Craig Spada issuing a penalty shot with 37 ticks left on the clock. Thompson took the puck in on Binnington and slid it under the pads to knot the game once again at 2-2. Thompson became the first Otter to score on a penalty shot since 2008, when Anthony Luciani scored on two in the season opener at Windsor. The two teams combined for 29 shots in the fast-paced second period. As the Attack continued to step on the accelerator in the final 20 minutes, the Otters couldn't get their foot off the brakes. After Owen Sound's Garrett Wilson and Varone traded goals to make it 3-3 just less than three minutes in, Erie began to lose its power. And eventually, the Otters lost control of the game. Heelis' goal sparked the Attack offense, which scored two more times in just over three minutes to put the game out of reach. Bobby Mignardi scored on an empty net, while agitator Andrew Shaw put salt in the wound with a goal with just 12 seconds remaining in the game. The biggest enemy Erie had in the third was itself. The Otters fired just six shots towards Binnington, mostly because they spent almost half the period killing off penalties. Though the Otters killed off all three chances, the time spent in their own zone containing the Attack power play crippled their chances to produce scoring chances of their own. Erie was 5-for-5 on the penalty kill in the game. If there was any good news for the Otters, it came from Sudbury, Ont. The Eastern Conference Wolves beat Guelph 7-6, allowing the seventh place Otters to remain three points ahead of the eighth place Storm in the Western Conference standings. Every point is crucial for the Otters in their final 21 games, as nine points separate the No. 8 seed and No. 3 seed. Erie will put a lid on its five game road trip tomorrow afternoon against the Attack, scheduled for a 2 p.m. start. Second period_ 1, Erie, Varone 21 (Shields, Szydlowski), 0:32. 2, OS, Blacker 10 (Mignardi, Maidens), 10:04. 3, OS, Berdnikov 1 (Shaw), 17:12. 4, Erie, Thompson 28, 19:23 (PS). Penalites_ Szydlowski, Erie (holding), 5:52. Third period_ 5, OS, Wilson 31 (Fritsch), 0:18. 6, Erie, Varone 22 (Luciani), 2:53. 7, OS, Heelis 15 (Maidens), 16:41. 8, OS, Mignardi 21 (Blacker), 19:03 (EN). 9, OS, Shaw 13 (Berdnikov, Halmo), 19:48. Penalties_ Cazzola, Erie (holding), 9:17; Holden, Erie (boarding), 13:07; Cook, Erie (checking from behind), 13:42. Shots on goal_Erie 11-12- 6_29. Owen Sound 7-16-14_37. Power-play opportunities_ Erie, 0 of 2; Owen Sound, 0 of 5. Goalies_ Erie, Sadikov 36-31-5. Owen Sound, Binnington 29-28-3. Referees_ Craig Spada, Ben Wilson. Linesman_ Tim Steen, Mike Harrington.